The handwritten notes Franklin D. Roosevelt scribbled before giving his ‘Day of Infamy’ speech have been put on display on the 75th anniversary of the attack on Pearl Harbor. 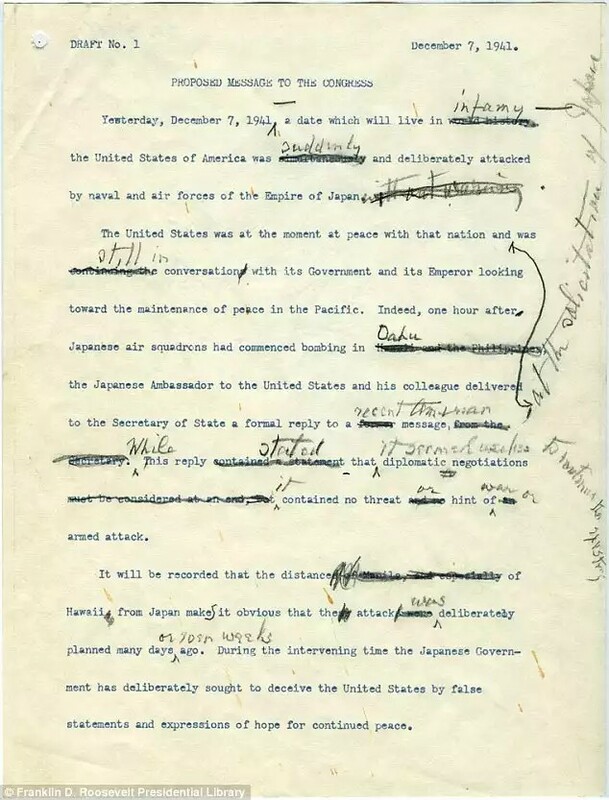 The original draft of the president’s speech is on display at the Franklin D. Roosevelt Presidential Library and Museum in Hyde Park, New York, to commemorate the 75th anniversary of the Japanese attack on Pearl Harbor. The former president dictated the first version of the speech to his secretary in the hours immediately after the attack, meaning he was editing his own words in later copies. In the opening line of the speech, FDR at first referred to the day, December 7, 1941, as one that would live in ‘world history’. The words were scribbled out and replaced with ‘infamy’. Check out more pictures, a video of this day and continue reading this article here!